Yeshivot Bnei Akiva News: Yeshivat Hesder Neve Dekalim Breaks Ground...Again! Yeshivat Hesder Neve Dekalim Breaks Ground...Again! On December 27, seven and a half years after being evacuated from Gush Katif and 30 years to the day after the laying of the cornerstone of its former yeshiva campus in Gush Katif, Yeshivat Hesder Neve Dekalim laid the cornerstone of its new campus in its new location in Ashdod. This is the yeshiva's third home since it was founded originally in the Sinai settlement of Yamit. The event was attended by Knesset Speaker Reuven Rivlin, Bayit Yehudi (formerly Mafdal) Party chairman Naftali Bennett, chairman of Yeshivot Bnei Akiva Rabbi Haim Drukman, Ashdod Mayor Dr. Yechiel Lasry, head of the Tnufa Authority Rabbi Dr. Ofir Cohen and many residents of Gush Katif who rejoiced in the renewal of this magnificent institution. Knesset Speaker Rivlin said: "I want to believe there will not be another expulsion of Jews from their lands. Division of the land will bring a disaster on the State of Israel." 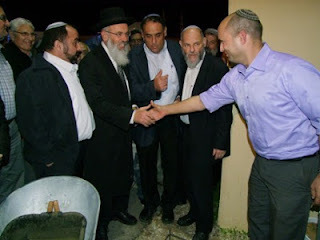 Chairman of the Bayit Yehudi (Jewish Home) Party Naftali Bennett said: "Torah study is not a sectorial interest – it is the interest of the people of Israel. We will work to strengthen the Torah world. We need to strengthen all Jews who learn Torah, no matter if they are secular, religious Zionist or haredi. "European leaders are now saying that they will impose the division of the land of Israel and I tell them: We are not a protectorate of any other state. We will ensure that the next government will not turn a single Jew out from his home." Elchanan Glatt, the Director General of Merkaz Yeshivot Bnei Akiva awarded a certificate of appreciation to the head of the Tnufa Authority for restitution of the Gush Katif residents and institutions, Rabbi Dr. Ofir Cohen, for his support for the building of the yeshiva in Ashdod. Rabbi Cohen said that he remembers the yeshiva when it was in Neve Dekalim, and he was sure that the spirit of the yeshiva will continue to thrive and strengthen the city of Ashdod. Yeshivat Hesder Neve Dekalim is the continuation of Yeshivat Yamit that was uprooted from the Sinai settlement of Yamit with the evacuation from the Sinai Peninsula following the peace treaty with Egypt. The yeshiva, associated with Merkaz Yeshivot Bnei Akiva and headed by Rabbi David Gavrieli, was reestablished in the town of Neve Dekalim in Gush Katif. The yeshiva was moved a second time in the framework of the Gaza Disengagement Plan in 2005. 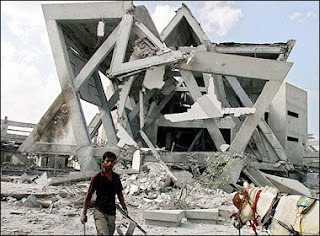 The yeshiva's famous Beit Midrash structure, in the form of a Star of David, was destroyed by the Palestinians immediately after the evacuation. Today the yeshiva operates in the city of Ashdod in temporary buildings until they will be able to move into the new permanent buildings. The yeshiva presently has about 140 students, but will grow to 300 when the new campus is completed. Hesder yeshiva students learn for five years while also serving in IDF combat units, with a number of married students continuing to study towards rabbinical ordination.